Whittier is one of the densest neighborhoods in Minneapolis, so our green spaces are particularly vital -- for families, for apartment dwellers and for the physical and emotional health of all residents. 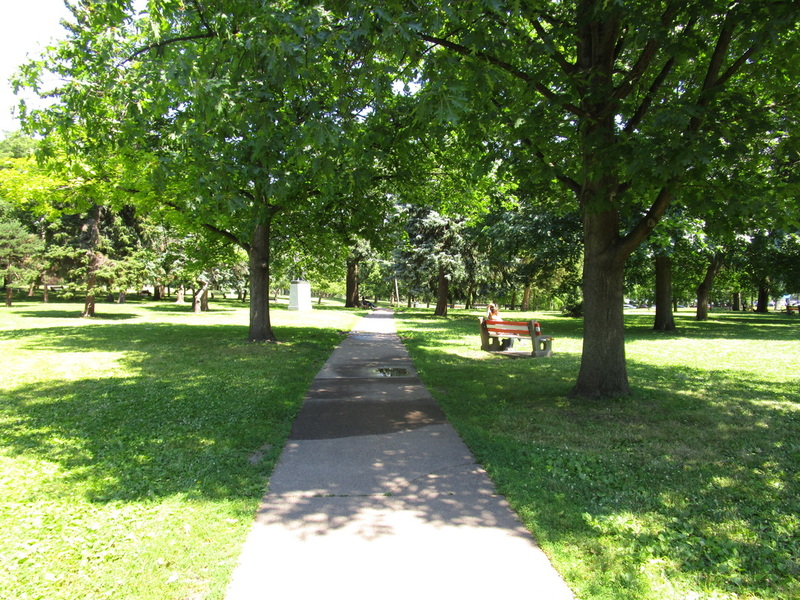 The largest park in the neighborhood and situated opposite the Minneapolis Institute of Art (Mia), Washburn Fair Oaks is a serenity park, a large expanse of green lawn and established trees in a dense part of the neighborhood. The park was once the wealthy Washburn family’s estate “Fair Oaks”, which is where it gets its name. The Washburn mansion that was part of the site was demolished in 1924. The Minneapolis Parks & Recreation Board website contains an interesting overview of the history of Washburn Fair Oaks Park and Morrison Park (where Mia now stands). Although mostly hidden from view of the street, this courtyard is accessible to the public and is a lovely green space, featuring seating, flowerbeds, and sculptures. It can be accessed directly from Stevens Avenue, via the adjoining MCAD campus, or from inside Mia itself. Admission to Mia is free and open to the public. One block to the east of Mia, Clinton Field Park is a great resource for families with kids in this corner of the neighborhood. It features extensive playground equipment and sports infrastructure like basketball hoops and a volleyball court. The Tot Lot is a small playground and park (1.14 acres), which is bordered on its east side by the freeway sound wall. It dates back to the construction of the freeway in 1968. The I-35W/Lake Street Reconstruction Project currently underway is occupying this space for equipment, but a full renovation of infrastructure and use of the Tot Lot is expected upon construction completion in 2020. Although technically not a park, the Midtown Greenway does provide a space free of car traffic and is a valuable recreational asset. The walking and cycling paths link Whittier to the Mississippi River in the east and Minneapolis Chain of Lakes in the west. 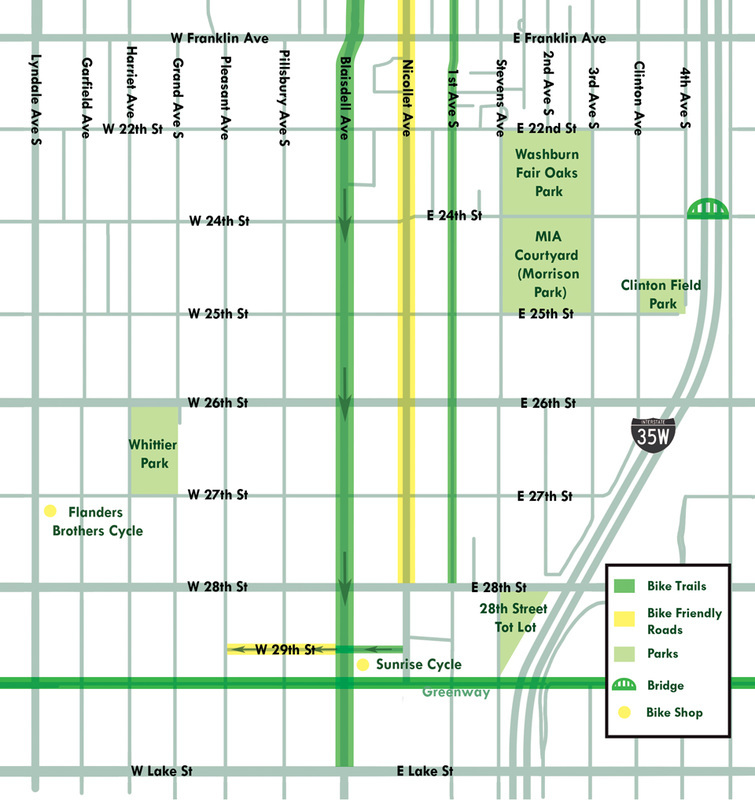 The Whittier Alliance has a representative on the board of the Midtown Greenway Coalition, which helps manage the Greenway, and we’re always interested in feedback on ways to improve the Whittier section of the trail.